Ferrari's Charles Leclerc stormed to pole position at the 2019 Bahrain GP. Not only did he score Ferrari’s first pole for 2019, but he also outpaced his highly rated, four-time world champion team mate, Sebastian Vettel. What made the achievement all the more special, was that Leclerc's brilliant run ensured that he became the second youngest driver in Formula 1 history to secure this position. Though a race is always won and lost on a Sunday, qualifying is equally important as it positions you to achieve the highest possible result. Despite Leclerc not getting the win due to technical issues late in the race, he garnered the respect and adoration of the entire F1 paddock, including Mercedes’ five-time champion Lewis Hamilton. Spoiler alert: Max Verstappen did not (yet) make the cut. The weekend of 12 - 14 September 2008 was a total washout as the Monza racetrack was covered in water. Rain drenched the track and paddock and did some wonder whether or not qualifying would, or could, actually take place. Thankfully, the sun came out and dried-up the track dried allowing for some awesome racing. Fans couldn't have predicted what would unfold. Nestled in his Toro Rosso, Vettel tackled the fast Monza racetrack with a determination reminiscent to that of the great Michael Schumacher. Not because he was fast but because he handled the cool, moist track better than the drivers in superior machinery, ie Ferrari and McLaren. Vettel battled against Hamilton and Heikki Kovalainen, both McLaren drivers at the time, for the top position, and secured it in what was a tense session. Vettel went on to win the race the next day. Competing not only against his Ferrari teammate Vettel, Leclerc had to also fend off strong challenges from Mercedes in the form of Hamilton and Valtteri Bottas. As the sessions began on Friday, Leclerc and Vettel were on the pace. Ferrari led all of the three practice session leading up to qualifying and was it any one of the Red drivers who would start the race from the front. But it was not for Vettel to take qualifying, because Leclerc showed everyone a clean pair of heels. He led all of the three qualifying sessions and even when he slowed down at times, he was still faster than everyone. Leclerc was drafted in to Ferrari at the end of the 2018 season from Sauber (now Alfa Romeo) and returned Ferrari’s faith in him with a stellar performance. In 2001, a very young Alonso entered F1 with now-defunct Minardi. He performed exceptionally and his services were taken up by Renault in 2002 as test driver. In 2003, he replaced Jenson Button as one of the team’s drivers and was partnered with Jarno Trulli. Truly a stroke of genius, Alonso put his stamp of authority on F1 and made the paddock take notice of him when. In only his second race for Renault, he took pole position at the Malaysian GP. At the time, Alonso’s feat made him the youngest pole sitter in F1 history and it would only be another five years later until Vettel would usurp him. Though the race and Alonso are no longer part of the active F1 circus, what transpired was the foundation of a great career for the veteran racer. He went on to become a double world champion (2005/06) and became one of the most respected drivers in all of F1. Barrichello is perhaps best known for being team mate to seven-time world champion, Michael Schumacher, but few can grasp that he had a tenure in F1 prior to joining Ferrari. In 1994, driving for the Jordan-Hart team, Barrichello took his race car to pole position during this demanding race. In the process he beat Schumacher, then driving for Benetton-Ford, Damon Hill (Williams-Renault), and his Jordan-Hart team mate, Eddie Irvine. The Spa-Francorchamps racetrack in Belgium looked a whole lot different back then but Barrichello did his best and secured pole. The race, however, was a different story as Barrichello spun out on the 19th lap. He would have to wait until the German GP in 2000 before registering his first win. Interestingly, this Brazilian driver’s very first race was on 14 March 1993, at the Kyalami racetrack in Johannesburg, South Africa. Driving for McLaren-Mercedes, Hamilton probably had one of the greatest and most memorable starts to a F1 career and he followed it all up with an active pursuit of the title in his debut year. In the races leading up to the Canadian GP, Hamilton would stand on the podium in all of them. In Canada, Hamilton raced to pole position, beating teammate Fernando Alonso and eventual 2007 champion, Kimi Raikkonen. Hamilton, very much a youngster at that point, showed exceptional promise and the 2007 season was, in more ways than one, a mere indication of what we’d come to see of this British driver. 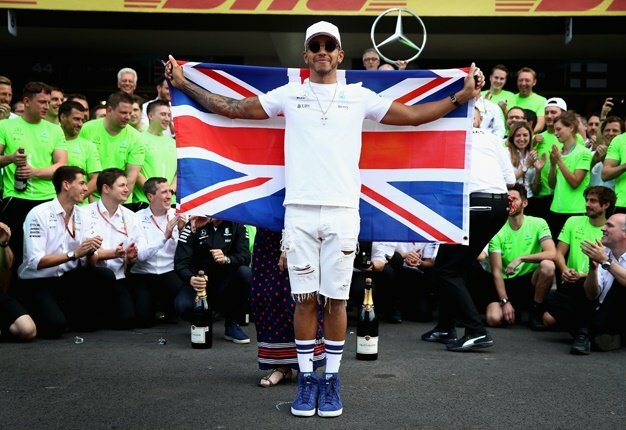 In the twelve years following his maiden pole position, Hamilton became a five-time world champion, only drove for McLaren-Mercedes and Mercedes, won a total of 74 races (and counting), and leads as the driver with the most number of pole positions in F1 history: 84.